Did I mention that I ran into Mr. Neil in Harlingen? 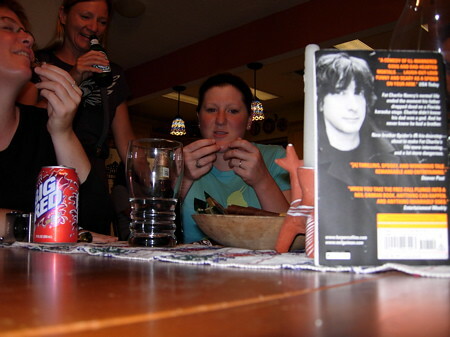 I was invited to a party at Marci Fuller's house and there he was at the kitchen table. Here he is regaling Amy Hooper, Marcie and Katie Fitzmier with his stories. This was the first time I'd run into him at the bird festival. 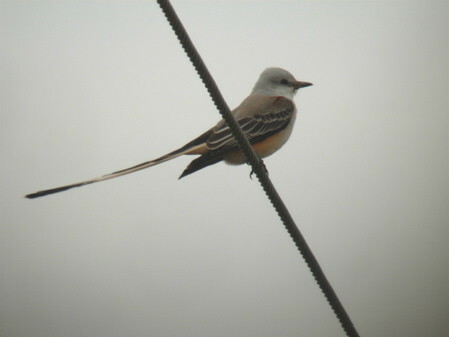 The fun thing for me when visiting another state is just enjoying birds that I don't normally see where I live, even if I have seen them before. 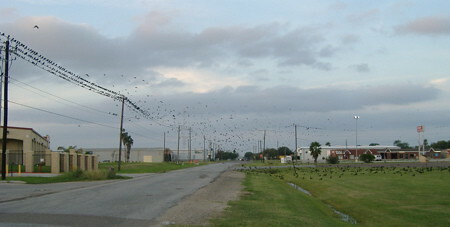 On the lines we have large flocks of great-tailed grackles and starlings gathering to roost for the night. 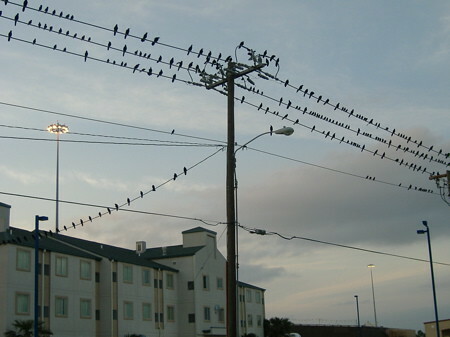 The grackles made so many strange clicks and whistles, they really remind me of dolphins. I really enjoyed seeing some different blackbirds. Here the blackbirds are coming in for one last bathe for the day in this drainage ditch. When the starlings joined it, there were so many of them flipping water around it created almost a mist and you could barely make them out. 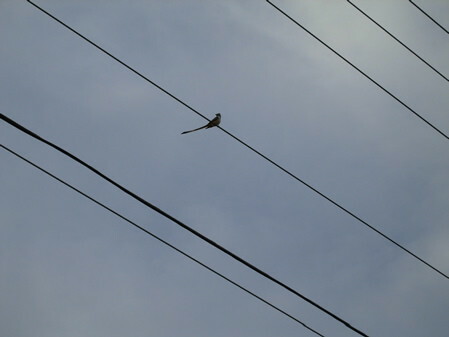 Even at a distance you can't help but notice that bird. I wonder what non birders from the East visiting the western United States think when they see these guys? 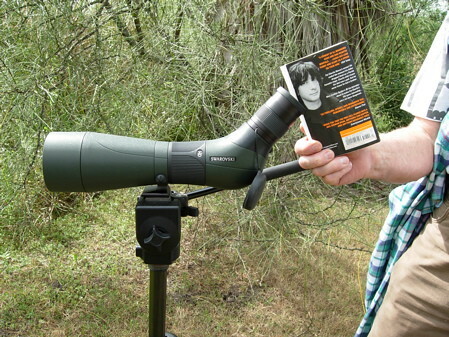 Neil appreciated being able to see these guys through the scope. 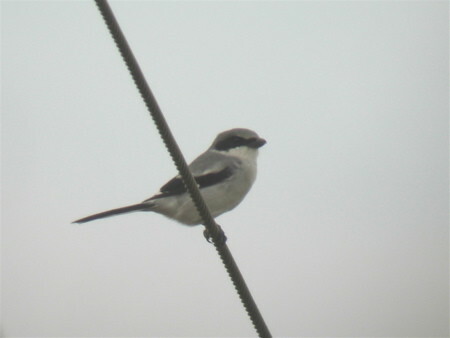 Here' s a bird that his more Mr. Neil's speed--a butcher bird aka loggerhead shrike! These predatory birds are different from raptors because they use their bill to catch and kill their prey and not their feet like a hawk or falcon would. Theses birds also impale their prey on thorns or barbs to make it easier to hack at and that's where their folk name comes from. 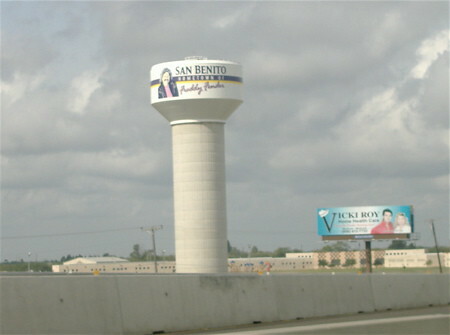 Another fun part of travel are just odd things, like this water tower proclaiming to be the home town of Freddy Fender. It was great to see the town of San Benito so proud of their native son with such prominent 1970s hair and handlebar mustache. If you ever find yourself in Harlingen, Texas either for the RGV Bird Festival or just going on your own, I can't recommend this place enough. 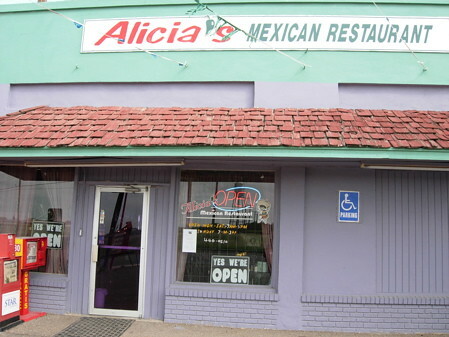 It's called Alicia's and I was introduced to it by the Eagle Optics staff. They are only open for breakfast and lunch and you get large portions for a small price. Think a whole Mexican style breakfast for $3.75. Another great place for lunch and dinner is Pepe's but be sure to specify that you want the hot salsa. 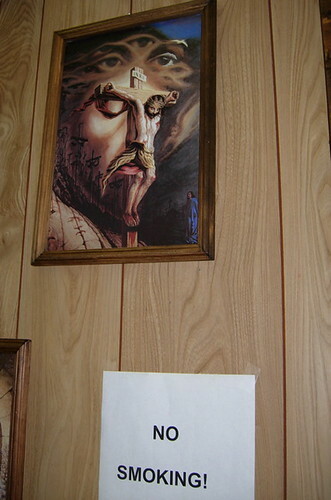 Part of Alicia's charm is the artwork on the wall. 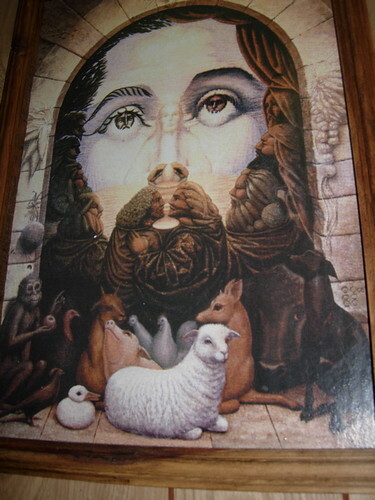 Check out all the deep inner meaning. I like how the loin cloth morphs into the mustache. 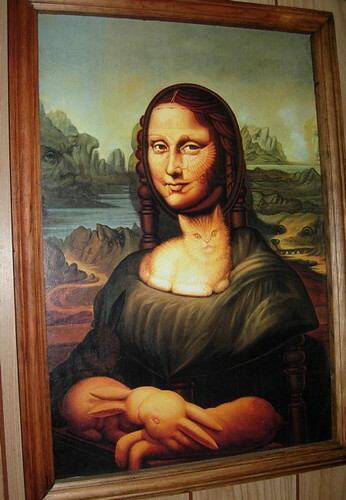 The Mona Lisa bunny hands freaked me out at first, but then the growling dog behind her weirded me out more. Don't even get me started on the men in the mountains. 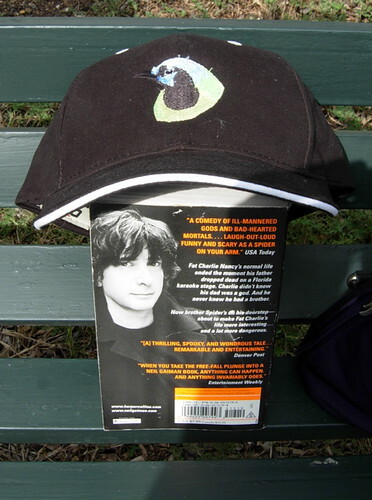 I must say, they had cooler hats at the festival. It's not often you see a black cap and then add such a striking green jay to it. Mr. Neil looked very smart with it on. I think this brings the RGV coverage to a close at the moment. It was an awesome time and I hope to go again next year.